June 23, 2017: New redshift catalogs based on VLT and GLASS spectra have been added for six clusters. See the headers of the catalog files for references and acknowledgment information. Note that the MACS 0416 and MACS 1206 "_vlt_vimos_*zcat.txt" files are replaced by the "_vlt_muse_*zcat.txt" files. May 8, 2017: New catalogs from Molino et al. (2017) have been added. 08 Dec. 2015: Corrected CRPIX1 and CRPIX2 values in Zitrin model FITS files for MACSJ1115+01. Study the internal structure and evolution of the galaxies in and behind these clusters. The CLASH Multi-Cycle Treasury program (12065 PI: Marc Postman) will observe these 25 clusters over a 3 year period. The team has been awarded a total of 524 orbits of time on HST to conduct this program. For more information see the CLASH website at http://www.stsci.edu/~postman/CLASH/Home.html. This table lists the clusters that have been released by the CLASH team. The first version of the data will be released approximate 2 months after the last data are taken for a cluster. A second version will be released about 6 months after the last observation of the cluster. Note that at this time, all HST observational data have been released (30-mas and 65-mas scale data). In addition to the optical and NIR data here at MAST, IR data and catalogs from Spitzer, and submillimeter data from Bolocam, are both archived at IRSA (Bolocam, Spitzer). N.B. : MS 2137.3-2353 = MACS J2140.2-2339 at IRSA. Download PSF models for all filters here. cd /pub/hlsp/clash † The mass model for RXJ 1532 is based on only one candidate multiply-imaged system (not confirmed) and on constraints from weak lensing. Hence, it is a relatively crude model compared to those for the other CLASH clusters. See Zitrin et al. 2015 (ApJ, 801, 44) for details. The Merten and Zitrin models for MACSJ0416-24, MACSJ0717+37, MACSJ1149+22, and RXJ2248-4431 (a.k.a. 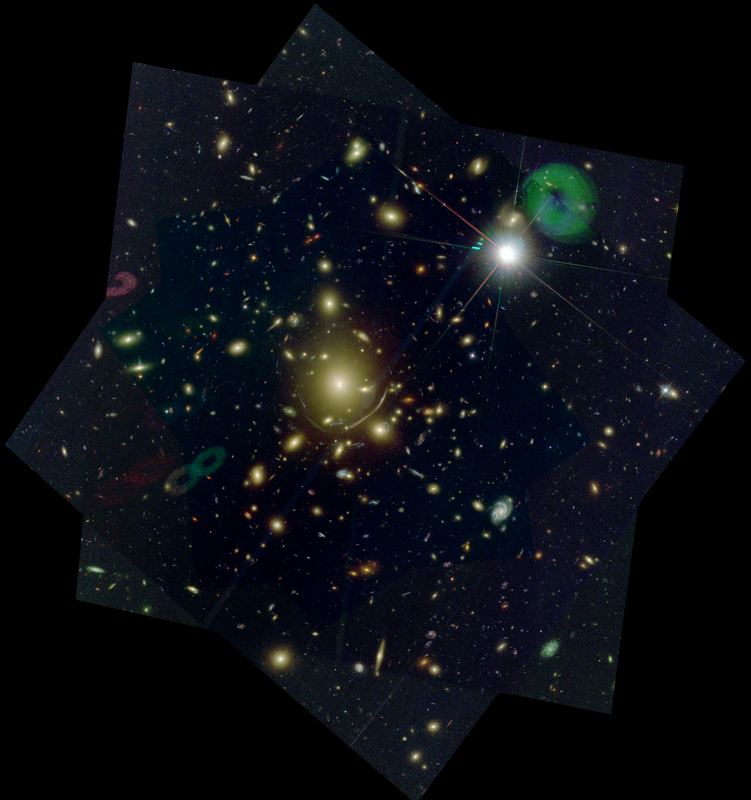 Abell S1063) were delivered as part of the Frontier Fields Lens Model program. Their file contents are identical to the Frontier Field versions, but have had their file names and headers updated to change "frontier" to "clash". The photometric redshift catalog for the cluster MACS1311-03 used B and V band images taken with WFI at ESO and z' band images taken with IMACS at Magellan, in addition to the Subaru data. Those FITS files can be found inside that cluster's Subaru data directory. 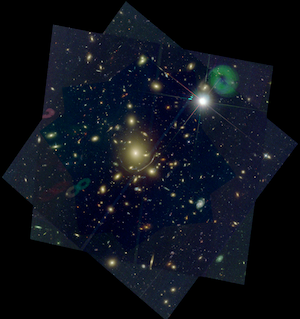 The photometric redshift catalog for the cluster MACS1423+24 used Ks band images taken with WIRCAM at CFHT, in addition to the Subaru data. Those FITS files can be found inside that cluster's Subaru data directory. The photometric redshift catalog for the cluster RXJ1347-1145 used g' band images taken with Megacam at CFHT, in addition to the Subaru data. Those FITS files can be found inside that cluster's Subaru data directory. A source catalog for the cluster RXJ2248-4431 (a.k.a., Abell S1063) using WFI at ESO was delivered as part of the Frontier Fields program. We provide a link to this file within the CLASH table on this page for convenience. All the mosaics provided here have already had all distortion removed by drizzling, and correct astrometry is provided in their header WCS (represented by CRVAL1, CRVAL2, CRPIX1, CRPIX2, CD1_1, CD1_2, CD2_1, CD2_2). Their CTYPE keywords also correctly reflect this (being set to "RA---TAN" and "DEC--TAN'). However, the Astropy tools "all_pix2world" or "all_world2pix" (contained in "wcs") currently attempt to apply SIP coefficients that are found in the headers, and therefore may not give correct astrometry. A solution is instead to use the Astropy tools "wcs_pix2world" or "wcs_world2pix" (also contained in "wcs"), which do not make this error and which give correct astrometry for these mosaics. Another alternative is to not use Astropy but instead use WCSTools, available from CfA, which also correctly calculates astrometry for these mosaics.